One of the most rewarding things about working on my suburban farm is when I come across the unexpected. You can plan everything to the best of your abilities, but fun surprises make for some pretty awesome rewards. For example, this afternoon I found a whole crop of carrots hiding out in the little spot where I planted them last summer. I swore these carrots were a resounding failure. Back in late August, well after their 75 days had ticked away, I plucked one green, fluffy top from the soil, only to discover the most pathetic, anemic root I’d ever seen. So I tossed it, and considered the rest of the crop a failure. 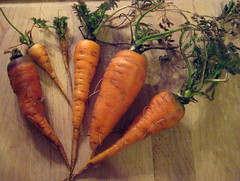 Today I decided to pluck one of the old carrots, and discovered a fat orange root. Wow! So I pulled the rest, and came away with four edible carrots. Now I’m rethinking carrots in the farm this year. I hadn’t planned on growing them, but now I’m excited about making a better go of it. hOur company offers a wide variety of non prescription products. Take a look at our health website in case you want to strengthen your health with a help of health products. Our company offers a wide variety of health products. Look at our health contributing site in case you want to feel healthier. Our company provides a wide variety of non prescription drugs. Look at our health website in case you want to look better with a help of health products. Our company offers safe non prescription products. Take a look at our health contributing website in case you want to improve your health. Our company offers generic pharmacy. Take a look at our health contributing site in case you want to improve your health. Our company provides a wide variety of health and related products. Look at our health contributing portal in case you want to improve your health. Our site offers a wide variety of non prescription drugs. Take a look at our health website in case you want to look healthier with a help of generic supplements. Our company provides a wide variety of health products. Look at our health contributing website in case you want to feel healthier. Our company offers a wide variety of non prescription drugs. Visit our health site in case you want to to improve your health with a help general health products. Our company provides a wide variety of non prescription drugs. Visit our health website in case you want to to improve your health with a help general health products. Our company offers weight loss products. Take a look at our health contributing site in case you want to strengthen your health.